FR. RICHARD MAG-ARARU’S session on “My Vocation in the World” impressed upon me that I cannot be God’s co-worker if I’m not a co-carrier of Christ’s cross. It’s difficult to be like Jesus. It’s harder to commit myself to Him. This Totus Tuus Journey is my second. I missed several sessions in the first and it shamed me no end that, in spite of those misses, I was allowed to be consecrated to Him (Mary never denies any child of hers is the rationale). I committed, therefore, to make up for those misses and encourage others to be as determined in the example I will show in succeeding TTJ sessions. So help me God. On his next topic, “Awe and Wonder,” Fr. Richard said that love for creation should be unlimited and include even the fleeting moth. That thought returned when I watched a noontime variety show the next day. It featured a musical portion about love between a cockroach and a caterpillar. The unlikely pair pushed my pen to poetry: The cockroach and the caterpillar fell in love, which did not have a human attribute and so did not judge. Unlike I, who used to abhor the first and avoid the other. As if I were not God’s co-creator. Coming to the commitment segment of the session, I pledged to care for creation as a daily appreciation thereof and a constant prayer of thanksgiving to God for the beauty around me. Fr. Norwyn Baydo’s session on “Images of God’s Beauty” told us that Jesus’ outstretched arms say: “This is how I love you.” His colossal 30-foot image atop Mount Resurrection in Monasterio de Tarlac confirms that. I’m amazed that the body, soul and spirit of human beings are perfect except for free will, which does not always conform to God’s. Yet when they realize their sinfulness, repent and reconcile with Him, they become in fellowship with their Creator. Fr. Norwyn left us a nugget: A crumpled or crushed P20-peso bill does not change its value, like man who, albeit sinful and stained, still retains God’s image. Because if we erase sin, our original beauty and excellence will resurface. Very sober sentiments for one who taught us the freaky “Isa-dalawa-tatlo” dynamic. Fr. Arnel Pagaduan handled “Evil Rooted in the Heart”: evil came before sin; our free will knew this yet we still chose to err. We know what sin is yet we still will it. We may be unaware of evil, which came before sin, but when we will to err, we allow evil to enter our life. The paradox that his session left unresolved was when Sis Ester commented that God made man disobedient so He could be merciful. Fr. Arnel said that God did not because man chose freely. I was inclined to believe the priest without diminishing Sis Ester’s insight because God never meddled in man’s emotions. Not during Adam’s fall (He could have prevented the apple bite), not during Christ’s sacrifice (He did not rescue His Son when the Latter asked about the Former’s abandonment of Him). Sis Ester, however, did not push it and the session satisfactorily ended. Fr. Richard returned with “Environmental Suffering”. When we let go of our Kasambahay Mean, I was thankful to assume some of her tasks. I took care of the trash and made sure my family and I did not contribute to the country’s garbage problem. Because my mind recalled a vivid picture of a drought in Africa, where a child, thirsty but having nothing to quench it, directly drank the piss of an animal. It was so horrific I deleted it as quickly as I saw it. But the horror revisited me during the day’s session I drove it away by vowing to conserve water and avoid wastage whenever I can. I will not exacerbate the indifference of litterbugs (I was like them then) whose apathy only equals Canada’s cold-blooded exporting of their trash to us! Sis Ana Marie Fondevilla, in her session on “False Wisdom,” made me commit to be humble, gentle and peaceable by understanding people better than their understanding me. I cannot be humbler than the Pope, whose story she told that, in a crying room, a lady was asking him to bless her. The Pope, never losing an opportunity for mercy, replied, “Before I bless you, I ask you to bless me.” It made firmer my resolve to hold my tongue and temper better than before. Bro. Milo Casals took on “My Emotions”. He started by saying, “I name my emotions according to my feelings. When I’m sad, I am sad, and I’m mad when I am.” Because, he said, most of emotional circumstances result from denial. Being honest to oneself is not only liberating but also spiritually uplifting. And he taught us the next thing to do: the pondering process. Having gone through it, Kuya Noel’s commitment was “No to corruption”. I hastened to add my negation to negativity. “My Sexuality” was the topic assigned to Fr. Rene. Before he proceeded, he distributed pieces of yellow post-its and asked everybody to define the subject. Then, when most of us had put in our two cents, he continued and added the defining quote of the topic, which summed up our separate insights. 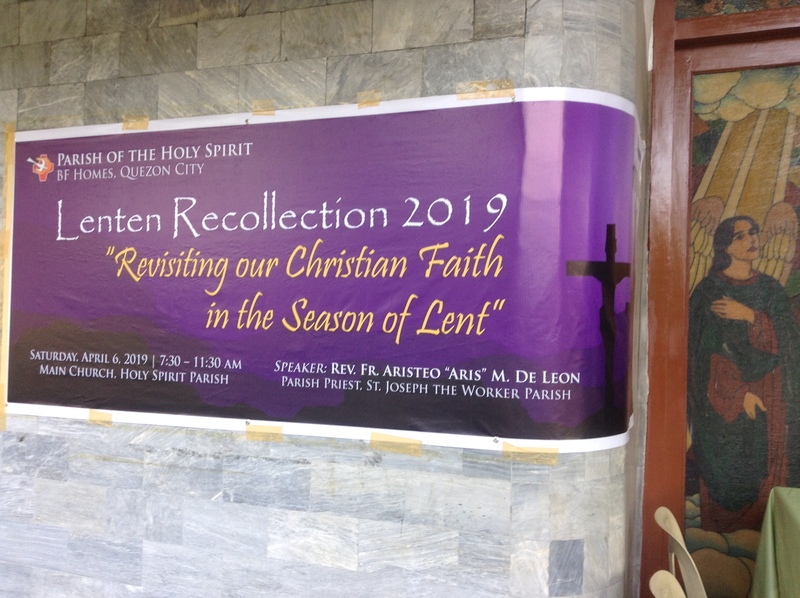 He related a story during an audience with Bishop Soc Villegas where the latter was chastising the “sins” of the clergy and zeroed in on his familiar face. This priest misses his departed mother terribly he made firmer his commitment to make a difference whenever he says Requiem to honor her. Bro. Milo returned with “My Relationships”. He recalled his previous topic and said, “Getting in touch with our emotion, naming it and pondering is how it all starts. We don’t have to do it alone, we reach out to friends, unless we are confidently in touch with our integrity. While self-love is the unconditional positive core, we are born to love others, touch them and be a healing presence to people. He also tackled later “My Money” by saying that what is valuable is not money but the law of God which is our real value. While he was at it, I noticed Ate Gel giving her brother Matty a pen and paper for the latter to be busy with because Matty was valuable to her. Bro. Milo’s insights gave me a whole new appreciation of what I used to have but parted with because of foolish indifference. I was a nobody even when I had money; I’m still a nobody without it. When I was earning, I did not use money wisely because my only concern was spending, not saving. I did not save because I did not love what I earned. The only difference (or similarity) between then and now is that I didn’t worry then when I had it so there’s certainly no reason to worry now that I don’t. Yet the saving grace is that now that I know God, I’m able to salvage a smidgen of the little that my volunteer work offers, because of love. Fr. Arnel came back with “My Work” and began with Paul’s faith, baptism and grace amounting to salvation because faith without works is dead. Therefore, once baptized, man accumulates graces slowly by his loyalty to his baptismal vows. From God’s view, salvation is freely given to all, contrary to the world’s mindset that we have to work for it. He posited that Tala Leoprosarium patients have faith that awes and inspires because their works uplifted that place. Conversion is a matter of choice; without work of faith, faith is mere caprice. A good example of conversion is the Good Samaritan. He loves the unseen God which led him to love his visible neighbor, albeit a total stranger. “My Body” was tackled by Sis Ana Marie. She said that heart is the totality of the person and will is more mind than heart. She suffused her session with hymns, anecdotes, spiritual sayings and a treasury of information that revealed her retentive memory. Fr. Benjie Notarte’s session was “My Higher Purpose”. Man has two desires, he said: self-gratifying and transcendental. Through learning who really are, we understand and affirm Jesus Christ. His treatise gave me a vision of the woman Eve, who caused the fall of man. She had to be redeemed by another woman and Mary was the only worthy one. Fr. Benjie’s Triune Council decision to choose Mary among all women I depicted through two sets of before-and-after pictures: of Eve with the apple and Mary with the cross; Adam with the snake and Christ with His mother. I entitled it The Crime and the Cure”. Later, Fr. Benjie’s comeback started stage three of the journey, “Mary and the Incarnation”. What he introduced it with has come to be an indelible music to my ear, “Mary Did You Know”. Matter of fact, I rewrote the lyrics to suit my state of need and retitled it “Mary Make me Meek”. He said that a child of God is a child of Mary. Which prompted Sis Angel to ask what about those who do not believe in Mary. His answer: I have difficulty consenting actively and responsibly to Mary’s presence in my life. Therefore, I commit to pray more actively to her and hold on to the rosary more than ever. His answer brought back to memory Fr. Fed’s take on other denominations’ lack of faith in the Blessed Virgin Mary. Simply, Fr. Fed said it was, for him, difficult to reconcile belief in Christ with disbelief in His mother. Sis Ana Marie would return with “Mary and Christ”. Because our consecration is a renewal of our baptismal vows, Mary and Jesus are inextricably linked. While it is so acceptable to be devoted to both or either of them, the ideal way is to turn to the tree, Mary, to truly discover the fruit, Jesus. And she segued into a story. God was doing a tour of heaven and, when He got to the gate, saw a great mass milling about. He asks St. Peter, “Why so many?” The latter’s reply: “Lord, Your Son closed the gates already but Mary opened the windows.” As a parting gift, she gave us tips to prepare for the reign of Christ through an acronym PITCH (which renews our baptismal vows and recalls why we wore white (because we put on Christ): Pure and perfect practice; Interior; Trustful; Constant; and Holy. Sis Baby Deblois has been missed sorely and I could not contain my joy when she emerged for her session on “Mary and Baptism”. While she mutually received the sentiment, I also felt sad our reunion had to be brief because I had to leave for an equally important appointment. It was small relief that I stayed long enough to catch her pronouncement that “No prayer is wasted for all prayers are answered.” Much, much later, I would know from Fr. Fed that that is so because Mary is a great intercessor who allocates our prayers so much so that we are reassured that souls in purgatory whom we petition are released and find a rightful place in heaven. Bro. Milo’s next topic was “Mary and the Holy Spirit”. He talked about the Holy Spirit hastening to a soul that has Mary. I had to agree. When I pray to her, I feel the Spirit. Mary manifests in me when I listen to her in situations that test my humility and, immediately, the Holy Spirit is right with me. God cannot work, He will not work, without the Holy Spirit and Mary. Bro Milo, in response to Kuya Noel’s claim that Mary is all over the Apostles’ Creed and the Hail Mary, said that the rosary is a repeat of his commitments. Faith, Bro. Milo continued, remains humble even if overwhelmed or insulted. Mary was standing at the foot of the cross because she was not overcome. Mary is an echo of God; when we say Mary, she says God. We all act according to our beliefs but Mary is constantly face-to-face with God. Life, Bro. Milo concluded, is not matter; it’s what matters. We matter because of Mary. Following my commitment to pray the rosary forever, Kuya Boy committed to let Mary to take root in his soul. Kuya Noel committed to ignore people who make evangelization difficult. And Ate Tina committed to not lose faith. Then it was Fr. Arnel’s turn to render “Mary and the Church” by declaring that Jesus of history is Christ of faith. At the foot of the cross, both history and faith made Mary mother of humanity and John the representative of it. Continuing, he said that the Church is the visible sign of God’s love for us, the visible signs of the Church are the Sacraments. Mary and the Church are mothers essential to the Christian faith. Ideally, the Church ought to mirror Mary. But being “people,” she is susceptible to sin, unlike Mary who is “sinless” by grace. The tendency of humanity to sin is transformed by grace through Mary through Christ’s embracing of humanity. That is why the Church always renews herself. Because of Mary, God’s masterpiece, a mirror of God’s light, the light being Christ. Ate Malou: She facilitates my spiritual growth. Ate Angel: I’m happy that, through Sis Rose’s invite to join LOM, I transitioned to TTJ. I asked Mary to make me feel her; she did! Ate Taki: Gelly was sent to me by Mary. Sis Ester: Jesus always told me His Mom already told Him of my thoughts; I’m a thinking, not a feeling, person. Through TTJ, I felt Mary works hard for me. Ate Gel: When Dad was sick and died, Mary did not grant my request but made us go through it because of Peanut (her daughter). I don’t understand but God’s plans are bigger than me. Kuya Jowell: TTJ made me understand more Jesus’ desire to enlarge our heart and embrace suffering. Kuya Boy: I was 6 when Mom died in 1946. I never felt a mother’s love but Mary made me feel. Manang Cynthia: Gelly lent me two books, The Secret of Mary and The Secret of the Rosary. I used to say the rosary in a lukewarm manner. Now I feel it. I will not forget Fr. Dodong’s analogies. One involved man wanting to be a dog to know where his pet hurts. And another of a family of 6 whose mother had cancer, was undergoing chemotherapy and losing her hair. She started to have fits of depression and was snapped out of them when her family showed up one morning with their heads all cleanshaven. Sis Ana Marie returned once more with “Jesus and His Word”. She left us this legacy: To teach is to touch a life forever. Spoken like an educator. And repository of spiritual life and lore. For the first time, Sis Seneca Nipa joined the fray of facilitators with “Jesus and the Cross”. She said, “Jesus created laws intelligible enough for men to understand them. Therefore, Isaac Newton did not create the law of gravity but merely discovered it. Added she, Adam fell by the tree; Christ rose from it. Citing suffering as a frame of reference, she said Jesus had a choice but did not because He could not give up His love for man. She asked us afterwards how do we deal with suffering. Kuya Boy: I pray when I encounter difficulties and realize I’m not perfect. I pray and offer the difficulty. The hurt is still there. But the pain was worth it. Sis Ester: I was not aware of my suffering when young. Lack of faith is worse than suffering. Sickness is grace. Acceptance, not denial, makes suffering fruitful. Sis Senn: The sad thing about suffering is when it’s wasted. Me: I used to dodge suffering, even used other people to suffer for me. I get away most of the time, it felt good, but conscience bothered. “Jesus and Love” returned Sis Ana Marie to us. She had the perfect examples of love in the gentleness of Popes John Paul II and Francis. Which was echoed by Ate Mom Mila, who said that, “If the popes were captivating, what more of Jesus? This recalled to mind His gentlest of eyes, which captivated Dimas, and His smile, which melted his heart. Which Jesus remembered when He heard Dimas reprimand Gestas for mocking Him, and promised Dimas paradise. The greatest thief “stole” it with Christ’s permission. Kuya Ed’s take was that Jesus maintained the iridescence of His eyes, so scintillating, so sinless, so like “The (encompassing) Eye”. When Bro. Milo came back to facilitate “Jesus and the Disciple,” he had an onion with him. My slight wonder easily dissipated when he started peeling its figurative layers, like one peels the real thing, likened to sinful man, even if it makes one cry, because sinning is suffering, until one gets to its core, peeled of all sinful layers, the pearl of great price, sinlessness. Bro. Milo said that to establish intimacy with Jesus, we have work to do. We don’t have to see ourselves on the surface only. Because projecting an image is a problem of having no intimacy with Jesus. His other nuggets: Why would God create when He is complete. Especially, why would He waste creation on one who turned? No scientist will discover God’s love unless he believes in it. Projecting an image is a problem of having no intimacy with Jesus. Accept, not pretend, our propensity to sin, the integrity of our inner truth which is love created by God. To encounter Him, we only have to be ourselves, not perfect. To be intimate with Jesus, we have to be fruitful; like the onion, we have to rid ourselves of layers to be our core. Abiding in Him makes simple an otherwise complicated realities. Then pagans and outsiders will be influenced by our love. “Jesus and Consecration” was Fr. Sherwin Nuňez’ topic and he defined consecration as giving all to God through Mary like Jesus’ death on the cross. As in the to-be-baptized child putting on white to wear Christ, he said the priest’s white is also to cover them with Christ. When one is consecrated, one becomes the salt and light of the earth. In all four stages of the TTJ, the essence lies in through, with, in and for Mary. As in cooking, where we imitate the chef, who is well-versed through his cookbook. Yet it is only twif the chef himself that we learn exactly what he knows. Consecration is not a fleeting thing, it is an imitation of Mary. Our sessions were capped with Fr. Sherwin’s “Marian Consecration” to prepare us for THE day. Each one of us was asked to look back at our journey and describe the experience using words, drawings or symbols. In turns, we gave our glimpses of what the pilgrimage was all about and what it did to our faith and persons. There were challenges, difficulties and fears but the pilgrims had one thing in common, a deeper understanding of not acting immediately but listening first, because consecration is resilience, allowing oneself to be molded in the womb of Mary, like Christ came out of it in the fulness of time. Only then can we see that the waters of baptism is just the start of an apostolic life, and the font is like a tomb, where we are born again to a mission of proclaiming the Gospel and renewing the face of the earth twif Jesus and Mary. On Consecration Day, all the pilgrims came in resplendent white, not only to wear Christ but to officially start how the journey had been, which had just begun again. Amen.